Add grilled chicken, flatbread and tabouli and you've got a Sunday feast. 1. Break off the last 2cm of asparagus to remove dry ends. Place a large non-stick frying pan on a medium heat and add olive oil. When hot, add asparagus, season with salt, and cook for about 5 minutes, shaking the pan (the asparagus should blister a little and soften). Remove from heat. 2. Meanwhile, bring a large saucepan of water to the boil. Reduce the heat to low, then add the vinegar and a pinch of salt. Stir the water rapidly in one direction to create a whirlpool effect. One by one, break the eggs into a cup and slide them into the water, gently tipping the cup near the surface of the water. When the eggs are cooked to your liking (about 3 minutes for a soft yolk), remove with a slotted spoon. Season with salt and pepper. 3. Combine the yoghurt and garlic in a bowl and season to taste. Place a large dollop of the yoghurt in the centre of each plate and smooth out. 4. Mix the tomatoes and cucumber together in a bowl and season with sea salt and pepper. 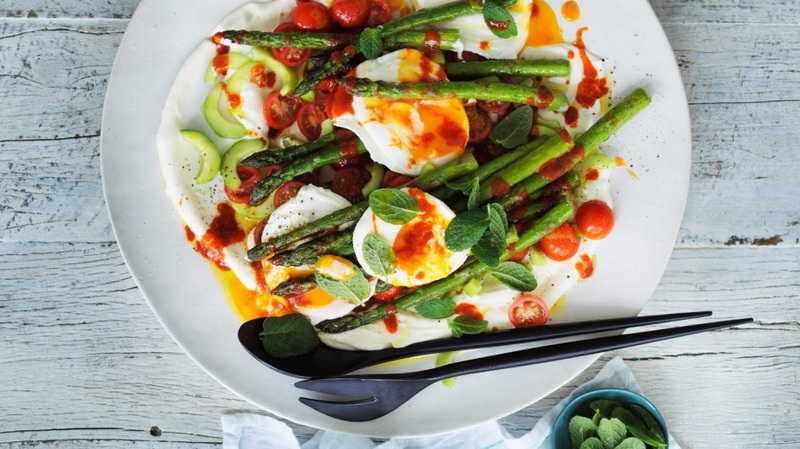 Spoon the salad over the yoghurt along with the asparagus spears. Top with an egg, drizzle with the chilli sauce and garnish with basil leaves, if using. Serve immediately.